For divers and snorkelers, the benefits of Wakatobi’s ongoing commitment to conservation are plain to see. Delve into the waters of the private marine reserve that surrounds the resort and you will discover a vista of pristine coral formations and thriving marine life. But perhaps even more impressive are the things the big picture doesn’t reveal. Take a closer look, and you will discover dive sites rich in macro life, including hard-to-find and rare treasures that will delight fish watchers and photographers alike. Here is just a sampling of what you may find on some of Wakatobi’s favorite sites. At Wakatobi, you don’t have to go far to find unique marine life treasures. Prime hunting grounds are as close as the resort’s famed House Reef. Encompassing a rich array of colorful coral slopes and shallows the House Reef is less than 80 yards (73 metres) from the shoreline to the drop-off. The search for macro treasures can begin right at the resort jetty. In addition to providing shelter for schools of fish, the pier’s large concrete columns and beams are home to an assortment of shrimps and crabs. The wealth of macro subjects in this area is seemingly innumerable, with the list running from a multi-species collection of anemone fish and the chance sightings of leaf scorpionfish, crocodilefish and pipefish. The upper shelf of the House Reef rises to a coral lip less than two meters below the surface. Along this edge, ample ambient sunlight makes it easy to locate invertebrates such as imperial, bubble, and crinoid shrimp, or to penetrate the camouflage of a frogfish. The light also brings out the full coloration of the numerous species of nudibranchs that move among the corals. Just beyond the lip, the reef drops away sharply, with slopes and walls that are riddled with crevices and ledges where numerous species of invertebrates make their home. The shallow grass beds between reef and beach are also excellent macro hunting grounds patrolled by octopus and juvenile cuttlefish. It is here that keen observers may find cryptic species such as ornate and halimeda ghost pipefish hiding in plain sight. At any time of day, there’s plenty to keep fish watchers busy at Dunia Baru. Snake eels slither among the corals, Spanish dancers flit about, and mantis shrimp stalk their prey. A closer examination of the bottom will reveal saron shrimp and there is an abundance of flatworms and pleurobranchs to discover. But the best time to catch a glimpse of the site’s most noted resident is early in the morning, or on a twilight or night dive. That’s when the pajama cardinalfish emerges from the shadowy interiors of finger and staghorn corals to begin its nightly hunt for small crustaceans. 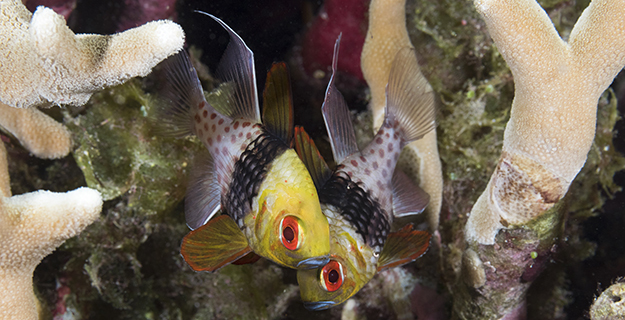 It’s not just nocturnal behavior that gives this fish it’s common name. The combination of red-tinged eyes, a dark vertical “waistband” like stripes, and a tail section decorated with bright orange polka dots evoke the image of a sleeper just awoken and still wearing his pajama bottoms. The House Reef is just the opening act of Wakatobi’s macro showcase. Most every dive site offers a chance for small finds. A perennial favorite with both photographers and fish watchers are the “odd couple” pairings of shrimp and shrimp goby. This often-described relationship involves a cohabitation in which the shrimp goes about the work of excavating and maintaining a shared burrow, while the more keen-eyed goby keeps a lookout for potential threats that would send both animals back into the subterranean lair. There are a number of species of goby and shrimp that can be found cohabiting on Wakatobi reefs. One of the more colorful finds is Randall’s shrimp goby, which doesn’t like to set up house in open areas, and instead prefers the added security of an overhanging ledge. Divers can usually find these fish and their attendant pistol shrimp in the sand-bottom undercuts of the site known as Cornucopia.